Whoever said you can’t have your cake and eat it too never stumbled upon the Sightmark Wolfhound 6x44 and M-Spec Mini Shot Kit. Military-inspired, these two optics keep you on target no matter the situation. Ballistically matched to .223, 55 and 62 grain ammunition, the Wolfhound 6x44 features an advanced horseshoe reticle with holdovers from 300 to 900 yards while the M-Spec Mini Shot provides an easy-to-find 3 MOA reticle, allowing an effortless shot from short to long range. 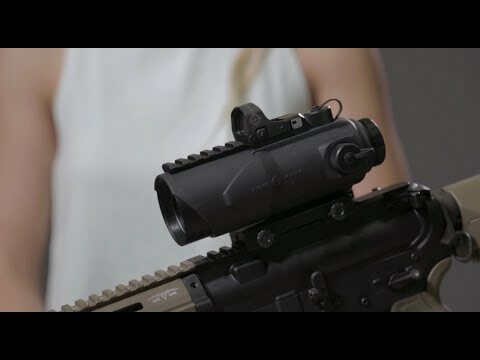 These two optics boast impressive battery lives; while the Wolfhound’s etched reticle can remain illuminated upwards to 4,000 hours, the M-Spec Mini Shot features the ability to last up to 30,000 hours. Weight w/ riser mount 3 oz.